Note to puppy owners. Ixnay on the store bought oysta. My favourite toys are not the ones my humans spent hours looking for on-line and then buying for me. Nope. Go to your Home and Garden store and head for the gardening section. Pick up some hand held gardening tools. The hard durable plastic is best. Make sure you stop by the bird feeder section while you’re at it. You’ll also want to get an assortment of medium size planters. Just the plain old black ones are fine. Be sure you have an old container to throw them into at home. Weather them for awhile outside, maybe throw some dirt and potting soil on them too for good measure. Most importantly, sort of hide them away in a corner like they are off limits for puppies. We’ll have a blast with them all day long. You can even mock scold us to sort of keep it real and interesting. Otherwise, what’s the point? Once upon a time, I use to chase my tail. Only I didn’t know it was my tail. This black spotted furry thing kept popping into my peripheral vision. Irritated, I would chase it until it went away. But every now and then, it would show up again. So I just accepted it as a new toy. That is until one day it got me really agitated. Having enough, I decided I would get rid of it once and for all. Only then did I discover it was my tail. Boy, that hurt for a week. One of my other favourite new toys are empty liter plastic water bottles. They make an awful crackling sound when empty. When Mr. human rapidly squeezes one, it freaks me out to no end. 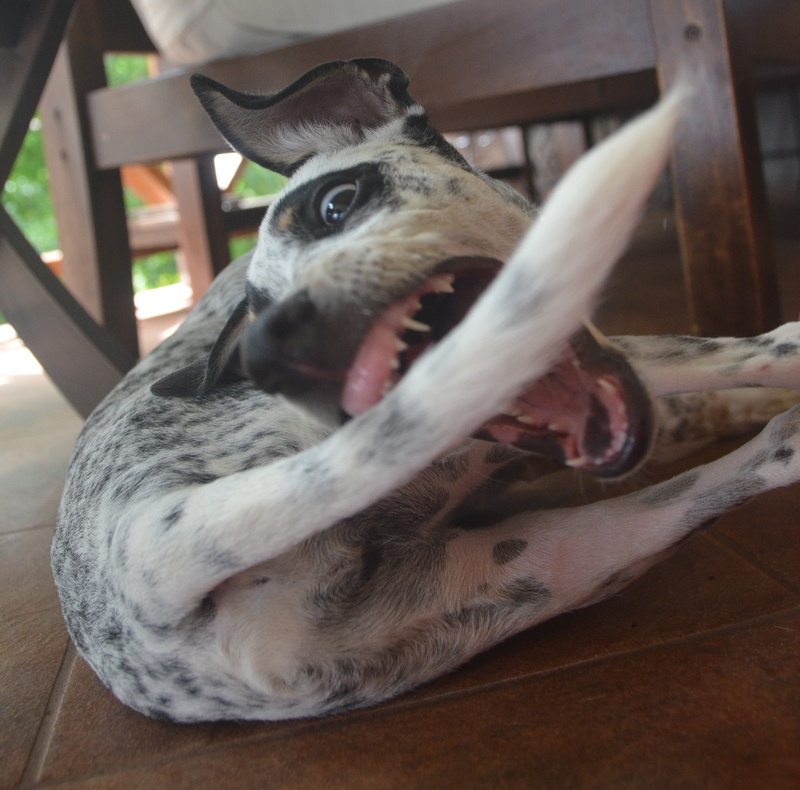 I go completely bonkers, running around like someone set my tail on fire. I have no idea where this reaction comes from. I can’t control it either. I guess it’s sort of like fingernails on a chalk board for you humans. He crackles and I go nuts, zooming in circles as fast as I can go. Might as well have zombies chasing six years olds around the house at midnight during a thunder storm. After a period of growing slightly accustomed to these bottles when crackled, if that’s at all possible, Mrs. human half squeezed one and put the cap back on so it was grabbable with my mouth. Gingerly, I sort of grabbed and then bit down on it. Well that sucker crackled and I jumped about two feet backwards. Not to be deterred, I went back for more. Grabbed it, and made it crackle just a little. Still freaked me out, but I controlled my urge for flight. So I crackled it some more. Hey, this isn’t half bad. Well the next thing I know I’m scooting that bottle all over the place, grabbing it, crackling it, which I now thought was total fun. Being almost featherweight, I pushed it everywhere, then I’d hop on it, which made it spurt out in one direction or the another with yours truly in hot pursuit. Hey, this was a pretty cool toy. One other thing I discovered. I must have a bit of retriever in me. For some reason I would chase that crackling thing all over the place, but then always have the urge to bring it to Mr. human. And I never bit down too hard on it either. Now what other toy would have done that for me? Helped me find my roots. 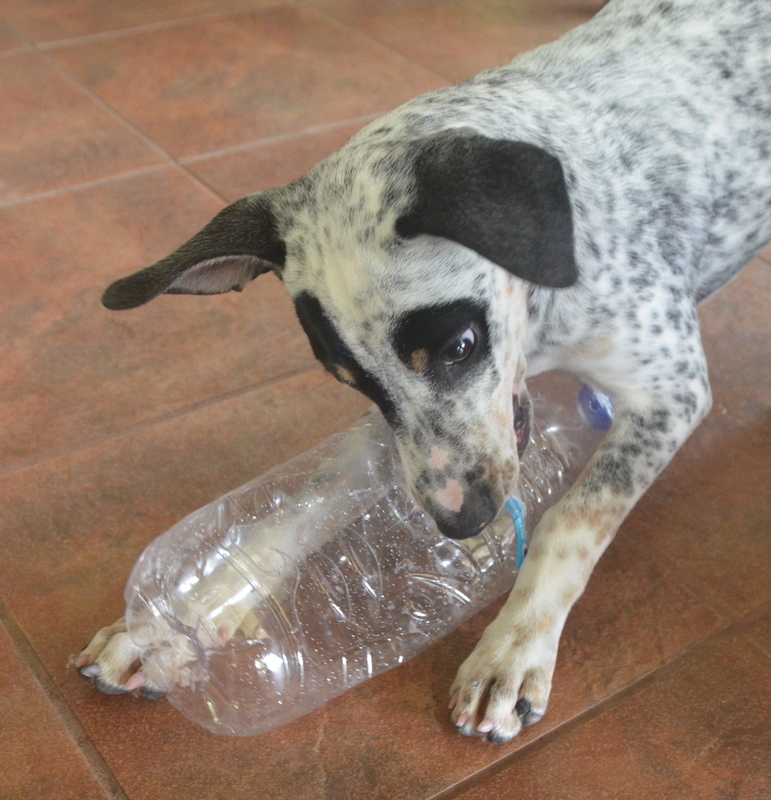 So before you puppy owners decide to toss those empty water bottles in the recycling bin, see if your puppy wants to have a go at it first. Then they can be recycled. Oh, one other thing. 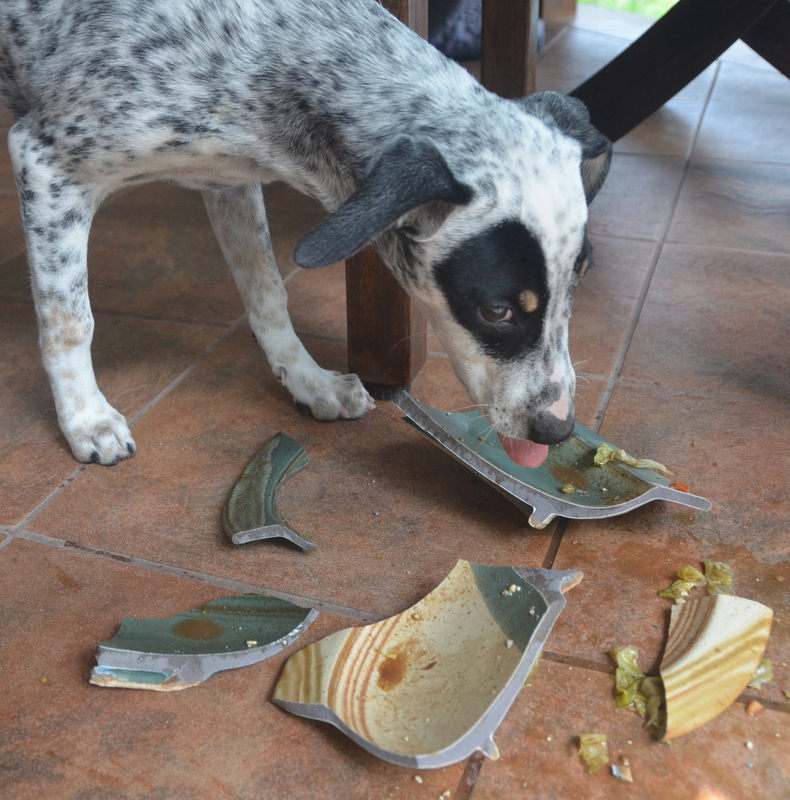 Don’t leave a nice pottery bowl with leftover lunch in it sitting on top of a flower bowl, on top of a patio end table and then leave a puppy unattended. Oopsy. Thankfully, Eric and Cathy, Lindgrenpottery.com, besides being friends of my humans, are one of my business sponsors. Be sure to watch Eric in the video. I’m putting in an order for a black and white Pepper shaker. Oh, yeah, almost forgot. Another pottery bowl too. HIlarious!!!! What an interesting life you have Pepper! !